What is the first image that springs to mind when you think “physicist”? Is it Sheldon from The Big Bang Theory? Or a grumpy, absent-minded professor? That is precisely what Kelvin, Physics and Astronomy’s most recent mentorship student, thought before he came to spend some time in the department. Despite the possibility of working with “grumpy, old people who talk strangely”, physics has been one of Kelvin’s favorite things to learn and hear about. So when his school offered him a chance to participate in the science mentorship program, Kelvin had his mind set on doing the mentorship through UBC Department of Physics & Astronomy. During my mentorship, I did many really cool things with [the Outreach coop student] Emma. I messed around with breadboards, played with seven segment displays, and learned how to solder things together. It was truly filled with joy and happiness. Sometimes, there isn’t too much to do so I just play around with the breadboards (it gets boring after a while). Other times, when there is an upcoming event, I get to test out all the cool things that the students participating will be doing. 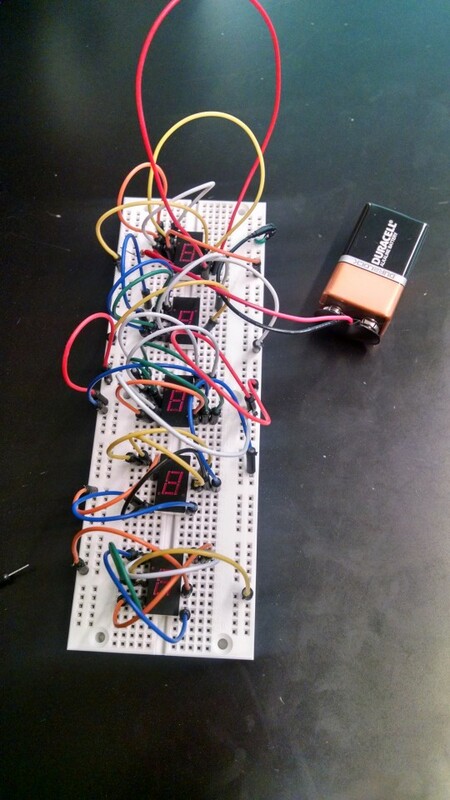 The 7-segment display activity Kelvin was working on during his mentorship experience. Kelvin also had a chance to meet with several professors in person. As Kelvin found out very soon, physicists do not really fit the expected stereotypes. Before meeting them, I thought all professors were really grumpy, old people who talk strangely. However, now I know that not all professors are like that. The professors I met were really cool, young, and friendly. They all welcomed me and tried to answer all the questions that I had. I even had a chance to participate in a lab that university students do. Kelvin was introduced to Dr. Hirohisa Takana, a UBC Physics & Astronomy Associate Professor, at TRIUMF. Hiro is really nice…I learned a lot about elementary particles from him. He took time out of his busy schedule to explain to a gr 10 student why neutrinos oscillate, and I really appreciate that. Apart from debunking stereotypes about physicists, the mentorship opportunity allows Kelvin to explore areas in physics and astronomy that he’s interested in, about what life is like as a scientist, and what university is like. He participated in an undergraduate-level lab, and learnt what the pizza prices are in the Student Union Building. Kelvin also offered the Outreach program plenty of help. He worked on the 7-segment display activity which was later used in the UBC Physics Olympics and the Most Exceptional Escapades in Science. If you are an elementary or high school student interested in having a similar opportunity, or simply want to chat with the department’s scientists, consider joining your school’s science mentorship program and contact us for a mentor. While not all professors are available, do fill out a mentorship request form with as much information as possible so that we can help plan something out for you.